So you know cigarettes are bad for you and you've tried really hard to quit smoking. Now what? Watch the video below to hear why the right sort of hypnosis can help you quit smoking in a whole different way. Take a deep breath and relax. I’m not going to start hitting you with endless statistics, or ‘facts’ like ‘Did you know smoking can cause lung cancer?’ You’re not an idiot. You’re not a child. For whatever reason, you’ve decided to quit smoking and you’re thinking of using hypnosis. So what you really need to know is - why hypnosis, and why should you get this program in particular? Well, read on to find out how the '10 Steps to Become a Non-Smoker' hypnosis download program will stop you smoking in a whole new way that gets round the usual pattern of stop-start-stop-start. All those good intentions made; cravings resisted; plans laid and for what? A few weeks off the cigarettes. And every time, it seems like it's OK to do it. But why? Because addiction is very clever, that's why, and it works at an unconscious level. So however strong your conviction is to start with, addiction waits until you are at a 'low' point, and then strikes. You know, when you’ve had a fight with your partner or one of ‘those days’ at the office. And suddenly you find yourself making up the most incredibly creative reasons for why it's OK to have 'just that one'. So how can you stay stopped? There is a profound difference between a smoker that has stopped smoking and a non-smoker. The smoker courageously resists having a cigarette, while the non-smoker couldn't think of anything worse than smoking. That’s if they give it a thought at all. You've probably heard those people who quit smoking 10 years ago and still say "Every time I have a beer I still want a cigarette" - if you’re trying to stop smoking that’s a terrifying thing to hear! It makes you think that you’ll be stuck with cravings for the rest of your life, and will be constantly thinking about smoking. There are a million and one ways to stop smoking. Nicotine patches, electronic cigarettes, willpower, chewing gum, tablets, lozenges, inhalers and even prescription drugs. In addition, there are plenty of well-meaning people out there willing to tell you how to stop smoking - quit tips are everywhere. But they all miss one vital component - the unconscious mind. If you are going to make the effort to free yourself from the terrible effects of smoking, why not do it right? 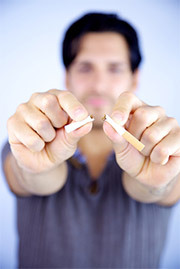 Use a proper smoking cessation program that will leave you free of the desire to smoke. "I seem quite happy and am enjoying the benefits of not being a smoker. I've smoked for 40 years. Now I am enjoying a new life." I've have had problems with my teeth and have had many pulled. About 2 years ago I quit smoking, I knew I had to if I wanted to save the remaining teeth. And let me tell you, it is a bummer not to be able to eat! I spent good money on a nicotine replacement medicine and I did stop smoking for about 9 months. Then a friend was smoking a cigarette at my house and I smoked one too. It wasn't long before I was a smoker again. It is depressing and I knew I had to quit again, but couldn't get myself to do it. I needed help. I have a friend who suggested your web site. Without knowing anything about hypnosis I dived in. I figured that it had to be a bit like meditation which I do have some practice doing. It seemed to work. I am amazed at the course you offer. I quit about a week ago after listening to step 7 (for the third time). I am most amazed that quitting this time was not a struggle and I seem quite happy and am enjoying the benefits of not being a smoker. I've smoked for 40 years. Now I am enjoying a new life. "It has now been 1 month and 3 days." "I hate cigarettes so much that I am positive I will never smoke again." "I had never used hypnosis before and just wasn't sure I should trust in it to work for me." "After smoking for 38 years I wanted to quit but didn't think I could do it. I decided to try the Quit Smoking Stay Stopped hypnosis download. I listened to it 3 times and set a date to quit. On that date I listened to it just before I smoked for the last time, then just quit, I was able to go 1 maybe 2 days before I would listen to it again to help me get through the urge to smoke, after a week I no longer needed to listen to the hypnosis and don't need the cigarettes anymore." "It has been over 3 months since I last smoked and hate the cigarettes so much that I am positive I will never smoke again." "Any smoker who wants to quit but can't for what ever reason. It worked so well for me that I can't imagine it not working for anyone who has even a small urge to do it." '10 Steps to Become a Non-Smoker' addresses every single psychological trick that smoking addiction plays on you and frees you from its grip. 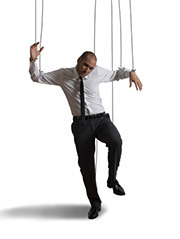 The hypnosis sessions will gently move your mind from its current addicted state to complete freedom from cigarettes. No longer will you be controlled by the need to smoke. No more planning your day so you can smoke, no more running outside at work or at parties, no more worrying whether you have enough cigarettes left. Use hypnosis to quit smoking so you’ll be a real non-smoker afterwards - someone completely disinterested in cigarettes. So what's so unique about this program? Well, we tell you to keep smoking. Seriously, this is not a course where you’re encouraged to have a ‘quit day’ marked on your calendar or are urged to cut back, or switch to a brand you like less. That’s because our course deals with your unconscious mind - you only quit when you reach the stage where you don't want to smoke any more. Of course you know all the dangers and how nicotine accelerates aging and damages cells. If fear worked, or just “common sense” you’d have stopped a long time ago. That's why we take all the pressure off and allow you to gently come to the stage where smoking seems like the wrong thing to do. Then you can truly become a non-smoker. "You continue to smoke while you progress through the program. You only quit when you don't want to smoke any more." No cold turkey. No stopping before you're ready. It’s more of a tapering off, until finally you stop buying cigarettes and chuck out all the smoking paraphernalia you've accumulated, and become a non-smoker. Then listen to Step One every day for a week, or until you feel ready to move to the next one. When you feel like smoking no longer interests you, you stop. What are the '10 Steps to Become a Non-smoker'? Over the years, smoking has wormed its way into your life so that it almost feels like it is part of you. This session will help you start to separate yourself from the cigarettes and reclaim your thoughts so that they stop serving the smoking, and serve you instead. Like any effective parasite, smoking feeds off the host without killing it, for a good long time. And all the time you are paying with your health, youth and vitality, the parasite's owners are benefitting. This session will help you turn your resources against the parasite, getting rid of the feeling that you're somehow 'losing' something by quitting smoking. There comes a time in every smoker's life that the downsides of smoking start to outweigh the perceived benefits. A deeper appreciation of this will help you be clear about the deal you have struck. After you've been smoking for a while, the addictive process changes your psychology so that you develop beliefs which keep you bound to the cigarettes. Unconsciously, you believe that you need cigarettes for certain things in your life. This session will help you undo those beliefs. Although it may not feel like it, in effect smoking dictates to you all day long. Or rather, it dictates to your brain, while the rest of your body has to try to survive its side effects. No-one likes to be dictated too, and this session will help increase your motivation to rebel against the cigarettes. Stopping smoking can feel like a leap into the unknown. Some smokers have described it as 'losing their best friend'. But by now, you will be much clear on the true nature of the relationship, and this session will help you feel energized and excited at the prospect of being free at last. After years of smoking, being a non-smoker can take some getting used to, due to the habit patterns formed over the years. Hypnosis helps you to quickly establish new ways of doing things without cigarettes, making being a non-smoker feel natural. 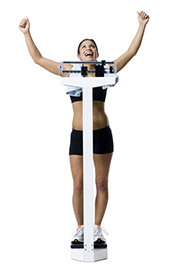 Gaining weight is a common fear when giving up smoking. This session will help you maintain a healthy weight, and adopt new healthy habits that will enhance your health even further. A final session to tie everything together and set you on the right path as a non smoker. Happy travels! When you sign up to the quit smoking program, you will receive a series of emails telling you how to use the program and get the results you are looking for. These are from Mark Tyrrell, the creator of '10 Steps to Become a Non-Smoker', one of the co-founders of Hypnosis Downloads. Mark is a highly experienced hypnotherapist and psychology trainer. His emails will remind you to keep moving with the program and help you stay focused on the goal. Although most people find going into hypnosis easy, some need a little longer to get the hang of it. That's why you also get a free Learn Self-Hypnosis download which will train you to go into hypnosis quickly and easily so you can get the most from your Quit Smoking downloads. BONUS THREE - Stay Stopped! We’re also giving away a Stay Stopped download as part of the pack. Stay Stopped is there for you once you have quit smoking, just in case you encounter a situation that makes you think about starting again. With 10 Steps to Become a Non-Smoker it's unlikely you will ever need it, but it's a good feeling to know it's there for you. In the meantime, we hope our full refund gives you peace of mind. We give a full refund on all our products (including 10 Steps to Become a Non-Smoker) within three months of the purchase date. Just send us an email, let us know it hasn’t worked for you, and we’ll refund you, no questions asked. We also think our course is superb value for money. It costs less than a month of smoking a pack a day - so if you do our course and quit, the course would have paid for itself within a month of you being smoke-free. And as most hypnotherapists charge about $100 an hour, our 12 downloads cost less than two sessions with a practitioner. All you need to do to get yourself on the path to a healthier and less stressful future is to download '10 Steps to Become a Non-Smoker' below. You will get immediate access to your program and can take the first step today; just use the button below to order now. "Now I don't even want a cigarette. I don't even want to be around people that smell like smoke." "I actually quit smoking a few days before I found the hypnosis downloads. I started doing yoga for the first time in my life and it really changed how I deal with situations. It has inspired me to use healthier outlets instead of toxic crutches to deal with my stressors. The How to Quit Smoking Hypnosis has taught me the psychological and physical addiction side to smoking and has helped me understand why my body craved nicotine. I smoked for 20 years. Now I don't even want a cigarette. I don't even want to be around people that smell like smoke. That makes me almost sick to my stomach. When my body does crave nicotine it doesn't crave a cigarette, just the nicotine and I let that feeling pass through me. It goes away within a couple minutes. Cigarettes no longer dictate my life. I love letting my hair down and it still smells like shampoo. I love being able to wear a scented body spray and know that I smell nice not like cigarettes. I am not longer embarrassed about this awful habit. It got to the point where I didn't enjoy smoking, it was an embarrassing addiction. Thank you"
"Forget the patches, forget the gum, get this download it really does work…"
I was a little unsure before downloading as it was the first time I had anything to do with hypnosis so I didn't know if it would work for me. I'm 41 years of age and have been smoking cigarettes since the age of 11 years. I have lost count of the number of times trying to free myself from the filthy habit. Countless numbers of cigarette packets under the tap, only to buy a pack the next day and choof away with lots of angst. I purchased your '10 Steps to Become a Non-Smoker'. I listened to each step about three times a day and some days I listened to 2 steps in 1 day. After 4 days I was ready to stop smoking and I did so. It has been 6.5 weeks since my last cigarette. I managed to stop with the slightest of cravings, your download has made it painless, I just wish I was aware of it 20 years ago. Forget the patches, forget the gum, get this download it really does work. "After 25 years of smoking I have totally quit..."
I am a general physician dealing in psychotherapy and hypnotherapy. That is a MD GP, pscho-hypnotherapist & EFT'ist. I divorced and faced bankruptcy several years ago and during that mourning period I felt some pain in my chest. I was smoking one pack/a day for around 26 years. I had an MRI and found that there was a narrowing of 30% in the descending coronary artery, and the situation was serious so I decided to quit. Several attempts have failed due to "I don't want to stop smoking because I love it" excuse. This time I really decided to quit and also was trying to go back to my own profession as physician (I was doing marketing training in the pharma industry). I had a chance to train in hypnosis and psychotherapy consecutively. During hypnosis training I decided to quit by the help of hypnosis but to be on the safe side I also started Zyban. I could not find a proper hypnotist here in Turkey (a non-expensive one I mean), so I decided to go through a downloaded recording. I wanted to stop smoking and needed somebody that was not dictating to me to stop smoking. I listened to the '10 Steps to Become a Non-Smoker' downloads at the same time every day. Gradually I refrained from smoking and later I totally quit. I listened the download every day at 11:00 a.m., the time when my urges were highest. After 25 years of smoking now I have totally quit smoking and can not cope anybody smoking near me. The fume of the cigarette suffocates me. After all those unsuccessful trials, now I feel like I have never smoked cigarettes. The best part is I can not remember the smoking actions and feelings associated with it. This is the best aid I could have received, and being a medical doctor I recommend the download to my patients who understands clean English. 10 Steps to Become a Non Smoker has been purchased by 3600 customers.